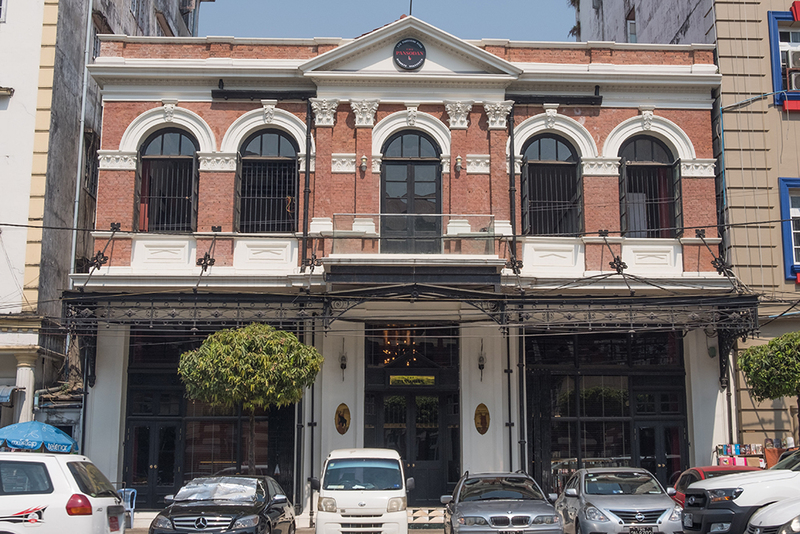 YANGON—Passersby had been watching a chrysalis of a handsome colonial-era two-story red brick building with tall arched windows, decorative columns and wrought iron awning on Pansodan Street for months. 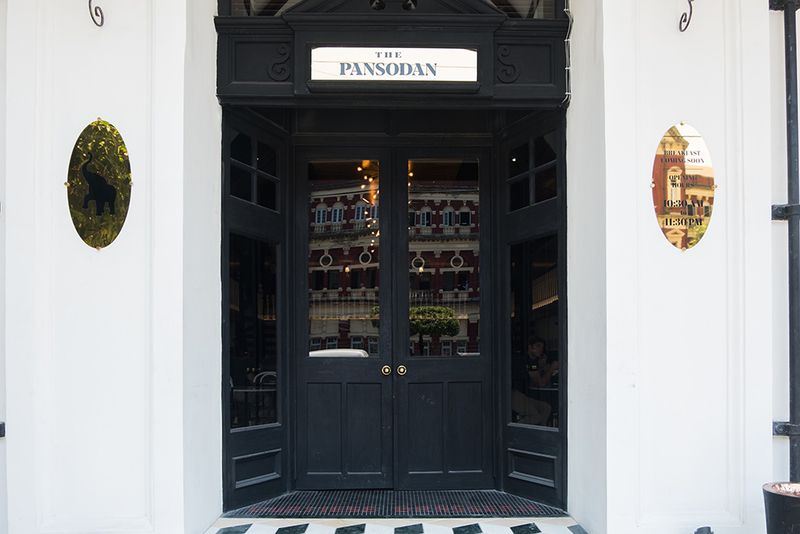 When The Pansodan opened on March 18 it was subject to a flurry of online hype. When I found the restaurant didn’t have an official Facebook page yet I was even more intrigued and knew I had to go there to experience it for myself. When I stepped into the self-described Burmese brasserie from the blazing April heat for a midweek lunch recently the place was buzzing. With few free tables downstairs, I went through the wood-panel stairwell to a table on the quiet mezzanine and lounged in a soft, oversized chair to watch the comings and goings of Yangon’s hottest new restaurant. A group of trendy millennials were catching up over lunch, a business lunch meeting with video chat was ongoing and a table of colleagues in matching shirts chatted and laughed. With one of The Pansodan’s four investors being a famous local interior designer, and another the director of Pun + Projects, which operates a number of modern dining and drinking outlets around Yangon, it’s no wonder the design chosen for this space is classy and comfortable. There’s a wonderfully smart art deco theme running throughout. The double-height main floor is bright and airy with a mirrored bar, marble tabletops, wood-panel walls and stand-out symmetric floor tiles. I was handed the menu, which features all the key dishes at the soul of Myanmar culture. 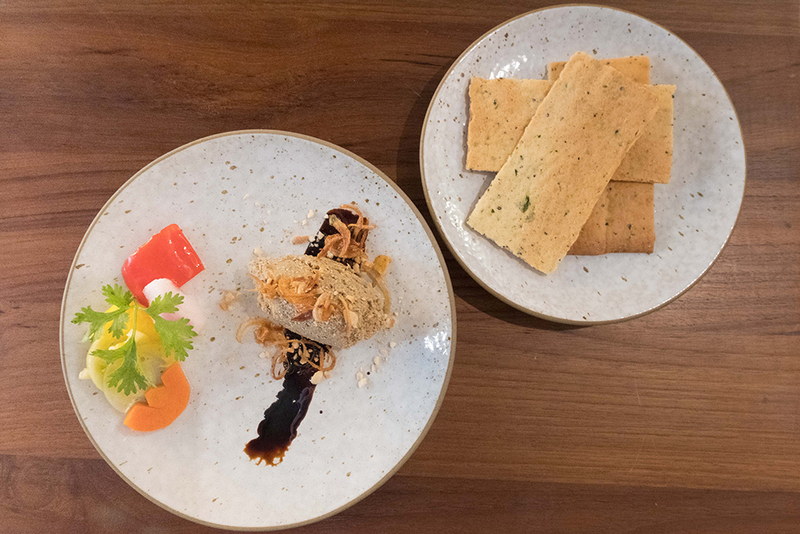 Mohinga, coconut noodles and Shan noodles were listed alongside favorites adopted from our neighbors—pork bao, samosa, keema paratha and biryani. The sirloin beefsteak comes with a pickled tea leaf chimichurri sauce. (To save you googling it, that’s an uncooked, garlicky sauce of South American origin.) The prices, on the other hand, are decidedly un-local, at 12,000 kyats for a prawn curry and a whopping 5,000 kyats for a tea leaf salad. I asked the very attentive member of staff which dishes have been the most popular so far and ordered an appetizer of Burmese pâté, the grilled chili chicken for the entrée and a lime soda to wash it down. Having read rave reviews of the dish on the Instagram accounts of Yangon’s most famous foodies who were first in the door during the restaurant’s soft opening, I couldn’t resist ordering the beef bone marrow too. 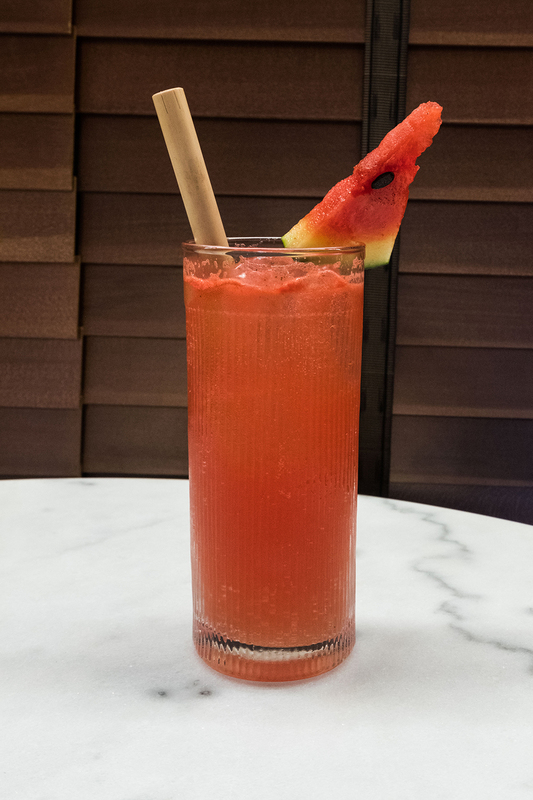 I enjoyed the lime soda, which was refreshingly tart and served with a bamboo straw. Then came the Burmese pâté, which is chicken liver pâté on a dash of balsamic vinegar reduction, topped with fried shallots and served with pickles and black pepper “crisps”. The pâté was moist and flavorful and the pickles were an excellent pairing. The black pepper crisps were more like crackers and, unfortunately, too brittle to scoop up the pâté, instead falling apart in my fingers. 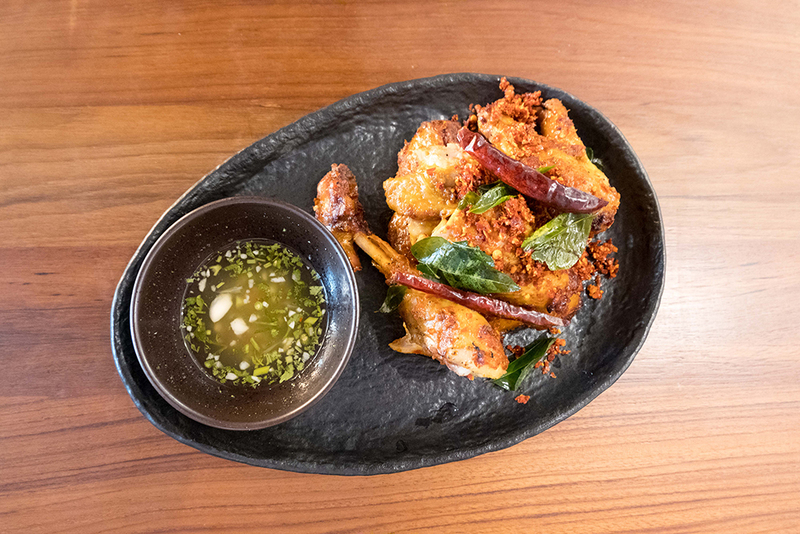 The grilled chili chicken was an aromatic and generously sized portion of “Myanmar chicken”, which means it’s not from a battery farm and, similar to free-range poultry, there’s less meat on the bone but much, much more flavor. The meat was wonderfully seasoned and moist and chili-lovers will be glad to hear it is hot, hot, hot! Then came the beef bone marrow. 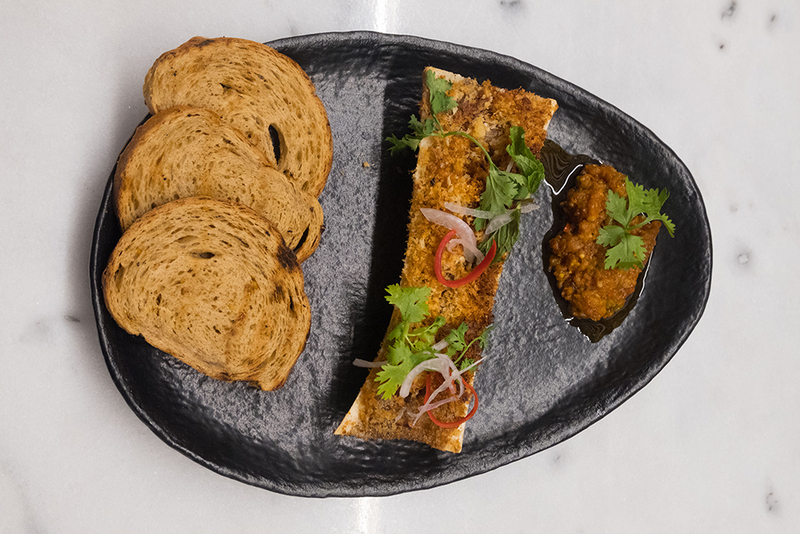 I was a little intimidated when confronted with a halved chunk of beef bone on my plate but digging in, I found the jelly-like marrow to be packed with deep, rich flavors and the gloopy texture was counteracted nicely by the topping of crispy dried shrimp and toasted breadcrumbs. Later, I was glad to have another occasion to meet a friend for after-work cocktails at the small but glamorous-looking bar in The Pansodan. The cocktail menu was not exhaustive but exciting, with innovative concoctions like the very refreshing Irrawaddy Fizz (Blanco vermouth, fresh watermelon juice, tonic, lime and yathabo) as well as some great twists on classic cocktails, like the Daiquiri Vert, which has absinthe and lime leaf. The signature drink, The Pansodan, was the most delicious by far: the vodka, lemongrass, lime and pineapple with a hint of fresh basil combined to make a light, multi-level flavor experience that I would come back for again and again. Apart from cocktails, the drinks menu has a good selection of favorite whiskey blends and bottles of wine priced upwards of 38,000 kyats. Overall, I was glad to find The Pansodan lived up to the hype surrounding it—especially on the design and fantastic renovation work. With so much beautiful old architecture in downtown Yangon crumbling for a lack of funding for renovations, I’m glad this gem on Pansodan Street will be preserved and loved by diners and snap-happy Instagrammers alike, all the while serving unfailingly delicious local cuisine and fantastic cocktails.